Nissan‘s latest research focuses on using brain power to control vehicles and enhance reaction time, safety and more. 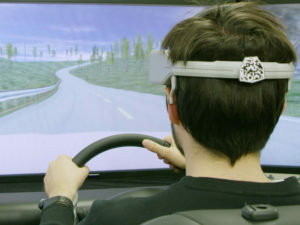 The new technology, called Brain-to-Vehicle, or B2V, works by measuring brain wave activity via a driver-worn device, which is then analysed by autonomous systems. By anticipating intended movement, the systems can take actions – such as turning the steering wheel or slowing the car – 0.2 to 0.5 seconds faster than the driver, while remaining largely imperceptible. Predict: By catching signs that the driver’s brain is about to initiate a movement – such as turning the steering wheel or pushing the accelerator pedal – driver assist technologies can begin the action more quickly. Nissan will demonstrate capabilities of this exclusive technology at the CES 2018 trade show in Las Vegas.